Fabulous, fun and affordable – Budapest is the perfect choice for a holiday no matter what budget you’re on. With our Budapest travel tips, we’ll give you an overview of everything you need to know to plan a smooth arrival and get started in the city. Budapest Airport is an easy-to-navigate airport in the city, with convenient public transport connections. Locals commonly refer to it as Ferihegy (its old name), and it is by far the largest commercial airport in Hungary, serving as a hub for Wizzair, and a base for Ryanair. Getting around in easy, both at the airport and in the city. Budapest taxi companies provide the fastest Budapest airport to city rides. As some cab drivers try to take advantage of travelers, it’s best to stick with the official partners of Budapest Airport, Főtaxi (cabs) and miniBUD (shuttle). The airport shuttle has a stand inside, near the baggage claim area, and also outside, next to arrivals. You might have to wait up to 30 minutes for the shuttle to collect enough passengers, and a ride to the downtown costs around 5000 HUF. Főtaxi has stands right outside arrivals – a ride could cost over 8000 HUF depending on traffic. At Liszt Ferenc Airport, there is a bus stop just outside Budapest airport arrivals. (Budapest departures is just as easily accessible by the same bus, too.) 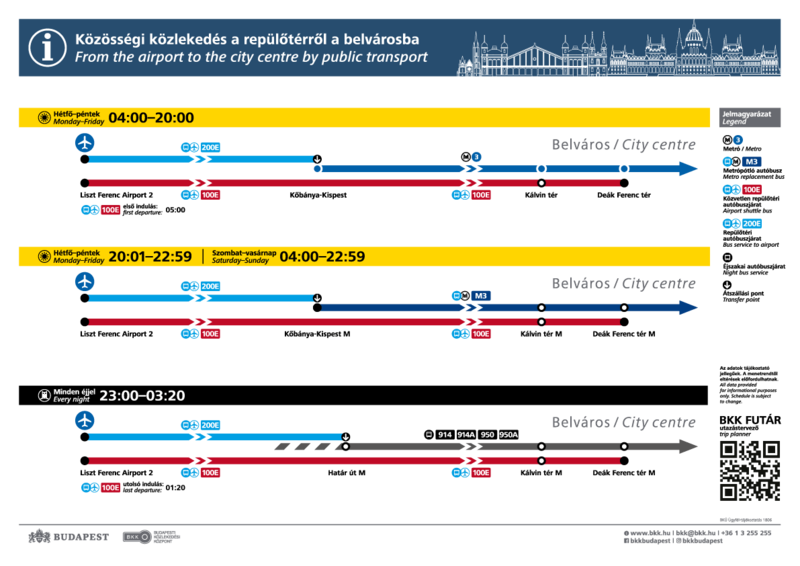 After 11 pm, you can take 200E to Határ út, and change tonight bus 950 or 914 to go to the city center. (100E runs until 1:20 am, so you can also take that before that). A Budapest metro map and all other important public transit information are available here. 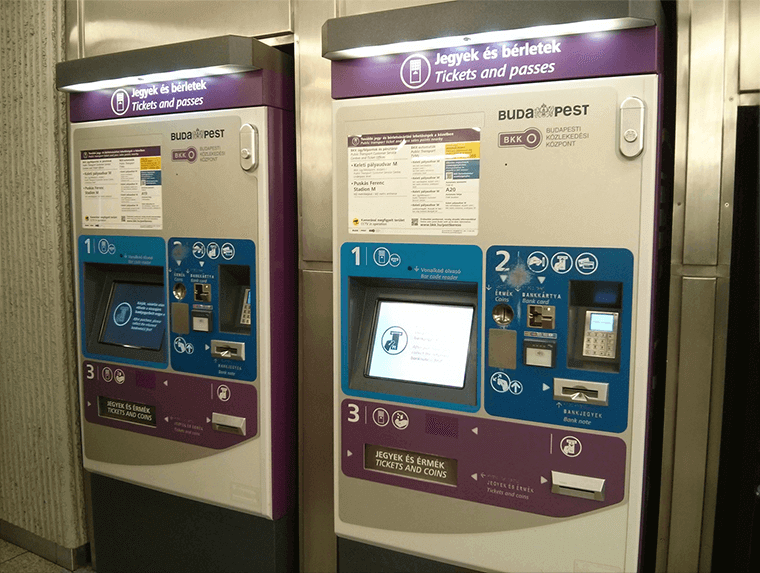 Tickets are available from machines next to the airport bus stop: set the touchscreen to English or other languages and select a ticket or a pass. You can pay by card or cash (card is preferable, as the rates for changing money at the airport are much worse than in the center). Budapest public transport is reliable and omnipresent, so consider getting block tickets or a pass. A single ticket costs HUF 350 (450 if purchased from driver). If you want to take 200E and then the metro, you will need two separate tickets. Exchange bureaus in the downtown offer much better rates than the one at the airport. So it’s best if you pay by card at the airport, and change money near Maverick – for example, Northline, Correct Change and Gold Change are all reliable chains with competitive rates. Feel free to ask for help or more information at the reception desk. Our staff is happy to direct you to even more discounts, for example, a 15% discount at Fat Mama’s eatery right next to the Maverick City Lodge, or free walking tours. Twice daily, free walking tours leave from the Basilica (the beautiful downtown cathedral not far from Maverick) to give you a primer on the city and its sights. The tours usually take 2.5 hours, spending some time both on the Pest and the Buda sides, covering the essentials of city sightseeing. Participants are encouraged to tip the guides. Sounds like fun? Simply ask at the reception desk for more details. One of the easiest ways to explore the city at your own pace is the flexible sightseeing offered by Big Bus Tours – you can hop on and hop off the bus as many times as you like, while discovering the most important landmarks, including the Royal Palace, magnificent Heroes Square or the breathtaking Parliament by the Danube. In fact, if you’d like to try a Danube cruise, – well, a Premium and Deluxe Tickets include a free 80-minute cruise along the Danube, floating by sights such as the National Theater or the Chain Bridge. Or, if you want to ride a bus that actually turns into a boat for a part of the journes, riding right into the river with you on board, check out the tours offered by RiverRide! All major car rental companies are present in town – you can get a car easily at the airport, or most places would offer an option to get it in town and drop it off at the airport. From traditional Hungarian food to street food, fancy to affordable restaurants – this is your lucky day, we have a nice and trusted guide for Budapest food for you! Budapest points of interest span centuries in time, and merge the best influences of the East and the West. Turkish baths, Roman ruins, Monarchy-era architecture and Communist styles blend into a modern city that’s livable as much as it is loveable. Add to this mix the cafés, pubs, ruin bars which seem to be there on every corner and there you have it: Budapest, the loveable and livable. Take a Budapest map to stroll from the City Park to Buda Castle and check out the very best the city has to offer, both in culture and in nightlife!